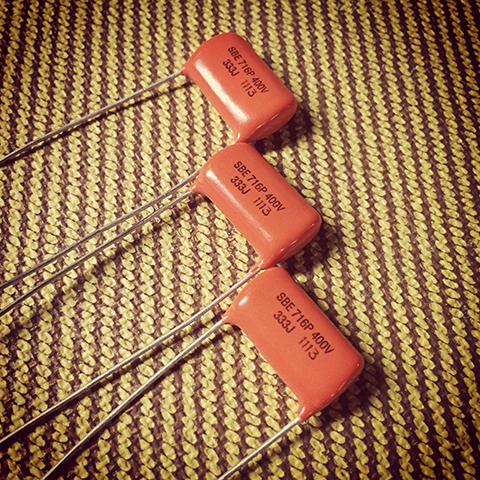 SBE Orange Drop Capacitors have a long history of proven reliability. 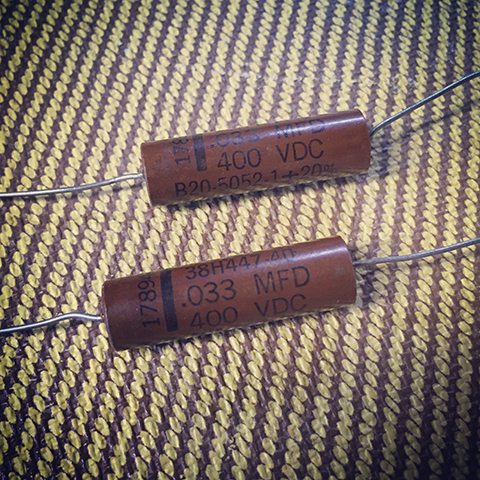 They are fine and reasonably priced capacitors which are well suited for guitar applications. These are made from polypropylene and aluminum foil and coated in the signature flame retardant orange epoxy. Alessandro wax and paper caps are amazing and offer a great tonal improvement. These caps are hand made and a faithful reproduction of the caps used in the mid 1950's. They are available in .05 MFD and .022 MFD only. They are not manufactured in .033 MFD so we don't list this is an option for our vintage repro Jazzmaster prewired kits. 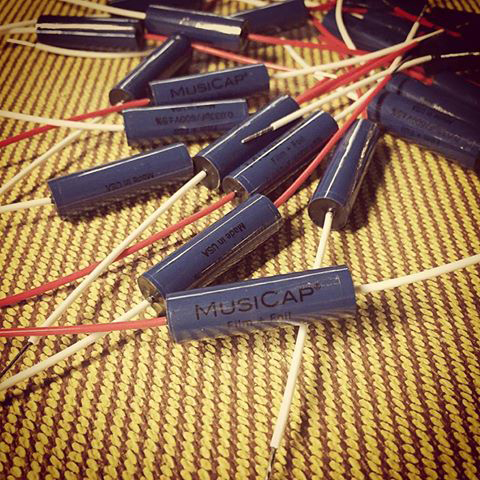 UpTone produces the world famous MusiCap film-and-foil capacitors (formerly Hovland MusiCaps), manufactured entirely in the USA with tight 5% tolerances. They are hand soldered and constructed using separate layers of premium foil and polypropylene films, and they have silver plated copper leads. They provide a dramatic improvement in clarity, focus and dynamics. These are the finest caps you can put into a guitar. 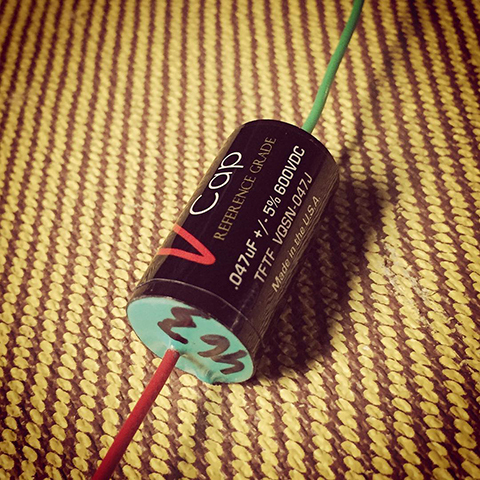 The V-Cap TFTF Teflon® film and tin foil audiophile capacitors are the result of an extensive research and development project by a team of world-renowned experts in electrical engineering, chemistry, materials science, and some of the top minds (and "ears") in the audio industry. These experts were commissioned to help design, build, and evaluate a "cost-no-object" capacitor for reference-grade audiophile applications. The resulting series of proprietary materials and processes has produced one of the most extraordinary, musical capacitors ever made. V-Caps are NOT a “rebrand” or relabeling of an already existing product, but a unique new capacitor design that has been meticulously engineered and handcrafted in the U.S.A. Andy Rothstein is featured on the VH Audio website here with some sound samples. This is production capacitor made by Tone Factory for Allparts and NOT new old stock. These film capacitors use oil soaked paper as di-electric material and are therefore well damped and very smooth and natural in sound. They are no longer availabe in .033 MFD so we don't list this is an option for our vintage repro Jazzmaster prewired kits. 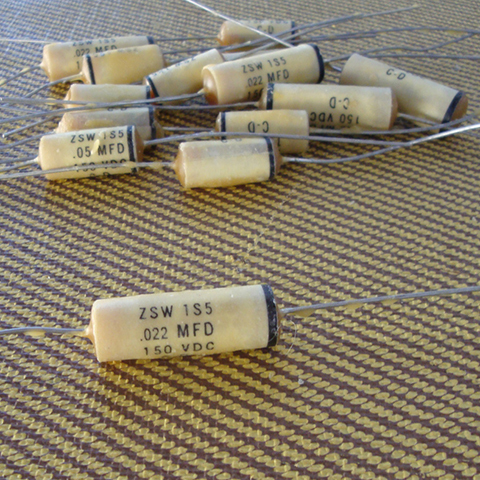 We purchased a fairly large lot of these in .033 MFD only, specifically because the Allparts Vitamin Q paper in oil capacitors are no longer available in .033 MFD. You will therefore see this one of the options for our Jazzmaster offerings. These caps are new old stock and were manufactured in the USA by the John E. Fast company. The part number is 178942, where 178 is the code for John E. Fast, and 429 indicates the 42nd week of 1959.